The Roman Catholic Church: What Separates Evangelicals and Roman Catholics? Evangelical Christians and Catholics — what’s the difference? What is it that really separates them? Evangelicals come from a movement that began as a “protest” against non-biblical elements of Catholicism — elements like the belief in purgatory and the practice of granting indulgences. Yet, there remain substantial points which evangelicals share in common with Catholics, including the inspiration of Scripture, the Trinity, the virgin birth, Christ’s atonement and His bodily resurrection. Indeed, with regard to these essentials, evangelicals have more in common with conservative Roman Catholics than they do with liberal Protestants. But despite these important areas of agreement, there are significant differences which separate evangelicals and Catholics. For example, while Catholics support the authority of the Bible, they also assert that the unwritten traditions of the Roman church are just as authoritative. In fact, that’s the reason scores of practices and beliefs which have no basis in Scripture at all are accepted by Catholics as “gospel truth” — practices like prayers for the dead and beliefs such as the infallibility of the pope. This lies in stark contrast to the evangelical position, which asserts that the canon of Scripture alone is the supreme standard and is the authority for all Christians. In fact, affirming otherwise compromises the very supremacy of the Bible as the Christian’s rule of faith (2 Tim. 3:16). Another major issue dividing evangelicals and Catholics has to do with the question of justification. Classical Catholicism holds the view that salvation involves a combination of faith and infused righteousness. This means that God’s grace gives us the capability to become righteous, and enables us to perform good works by which we can receive God’s forgiveness. Evangelicals, on the other hand, believe that salvation is by grace alone, through faith alone, and in Christ alone (Rom. 4:5; Eph. 2:8-9). To put it in perspective, we are saved by grace, but saved unto good works. Well, in spite of the vast differences between Catholics and evangelicals, I believe our points of agreement provide us with common ground through which we can share and discuss the gospel in love and with understanding. Protestants say Scripture alone is the authority. Catholics say Scripture and Sacred Tradition together (along with the Magisterium, which is the teaching office of the church that explains what Scripture and Sacred Tradition mean). 2. Worship (as seen at worship services, the way spiritual life is imparted). Protestants say the Bible is at the center. 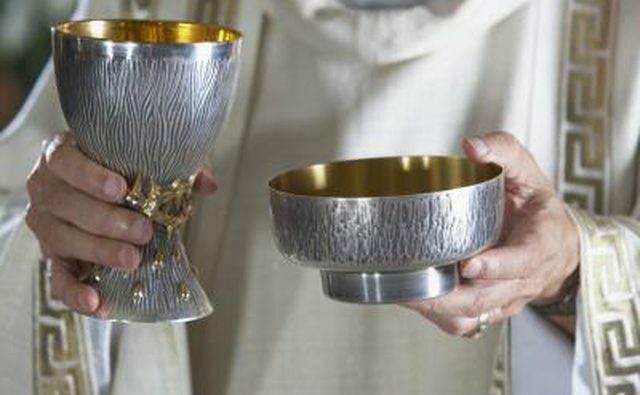 Catholics say communion is at the center. Question: "What are the differences between Catholics and Protestants?"